An inmate just-released from a Philadelphia prison was shot and critically injured after trying to car jack a correctional officer in the prison's parking lot. 26-year-old Jamal Bennett was discharged from Curran-Freehold Correctional Facility on the 8000 block of State Road around 10:30 p.m. Friday night. The career criminal didn't even make it off prison grounds before adding to his rap sheet. After 11 p.m., Bennett approached 66-year-old Michael Maratea in the parking lot as the 27-year correctional veteran was getting off his shift. The two men struggled next to Maratea's car. The officer was able to get his gun and shot Bennett in the chest. Bennett was taken to Aria-Torresdale Hospital in critical condition. Maratea was also treated at Aria-Torresdale Hospital for head and neck pain. Officials say that Bennett has been in police custody seven times since 2011. He had just been held for two weeks for probation violations on a previous weapons charge. 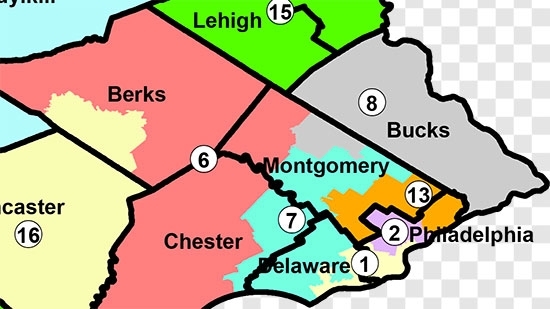 Pennsylvania Republican legislative leaders delivered a redrawn congressional district map to Governor Tom Wolf on Friday night. The Pennsylvania Supreme Court ruled that the previous map was unconstitutional back in January. The map was accused of being unfairly gerrymandered in the Republican's favor. Some of the most noticeably affected districts, including the 6th, 7th, and 12th, now look completely different. This new map was created by Republican leaders and did not pass as a bill through the House and Senate. The Supreme Court's majority opinion in the redistricting case was not finalized until this past Wednesday despite the first deadline being Friday. Legislative leaders believe the map complies with the court's mandates. "We complied with the words of the order. We did what we could do in light of us being hamstrung," said Drew Crompton, counsel to Sen. Joe Scarnati. Governor Wolf wishes it came in bill form. He now has until February 15th to submit a finalized map to the court. In that time, the legislature could put together a proposal in bill form. A Hamilton Township man has been arrested and charged in connection with the death of his 4-month-old son. 35-year-old Jose Rojas is charged with first degree Aggravated Manslaughter, second degree Aggravated Assault and second degree Endangering the Welfare of a Child. On January 29th, Hamilton Township police responded to the 6000 block of Hoover Drive in Mays Landing for the report of an unresponsive child. The baby boy had no pulse and was transported to Children's Hospital of Philadelphia. The boy passed away from his injuries on February 4th. Rojas had told police that the child had fallen out of bed, but doctors said the injuries were more consistent with a fall of 30 feet. The child suffered hemorrhages and blunt-force trauma to the head.